The Global Volcanism Program has no activity reports for Buzzard Creek. The Global Volcanism Program has no Weekly Reports available for Buzzard Creek. The Global Volcanism Program has no Bulletin Reports available for Buzzard Creek. The Global Volcanism Program has no synonyms or subfeatures listed for Buzzard Creek. 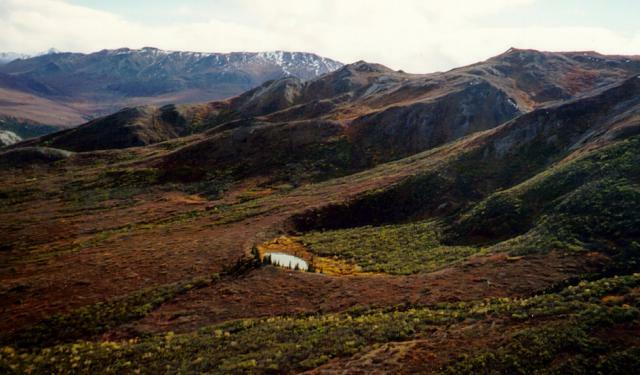 Two Holocene tuff rings form craters 300 and 66 m wide near the headwaters of Buzzard Creek at the northern foot of the central Alaska Range NE of the town of Healy along the Parks Highway. Both contain small lakes, and the smaller ring is about 200 m SE of the larger one. The total volume of ejecta, most of which is accessory material, probably does not exceed 0.001 km3. The ejecta overlies young glacial terraces that correlate with a glacial stage that ended about 10,000 years ago, and radiocarbon dates give an age for the eruption that formed the tuff rings of about 3000 years. This minor volcanic feature lies along trend with the Aleutian arc, but is located 320 km NE of its nearest Holocene neighbor, Hayes volcano, and lies directly over the northernmost corner of the subducting Pacific Plate. There is no Deformation History data available for Buzzard Creek. There is no Emissions History data available for Buzzard Creek. 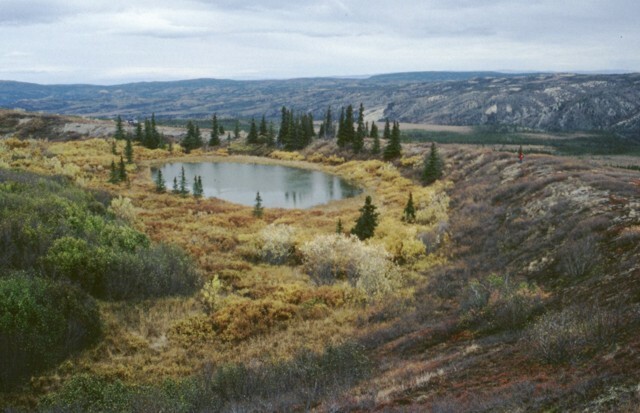 A small lake partially fills a 300-m-wide tuff ring, the larger of two craters at Buzzard Creek. The two craters were formed by phreatomagmatic eruptions about 3000 years ago that ejected country rock along with lesser basaltic material. An ejecta blanket has been traced about 1.6 m from the vent. The Buzzard Creek craters lie 320 km NE of their nearest neighbor in the Aleutian arc, Hayes volcano. Moderate explosive eruptions radiocarbon dated at about 3000 years ago formed two tuff rings in the central Alaska Range. A 300-m-wide ejecta blanket can be traced 1.6 km from the larger vent, seen in this photo. Ejecta on the crater rim consists of about 80% country rock fragments, with only 20% juvenile basaltic fragments. A geologist in a red jacket (right) and a helicopter (beyond the trees on the left side of the lake), both on the crater rim, provide scale. There are no samples for Buzzard Creek in the Smithsonian's NMNH Department of Mineral Sciences Rock and Ore collection. Large Eruptions of Buzzard Creek Information about large Quaternary eruptions (VEI >= 4) is cataloged in the Large Magnitude Explosive Volcanic Eruptions (LaMEVE) database of the Volcano Global Risk Identification and Analysis Project (VOGRIPA).